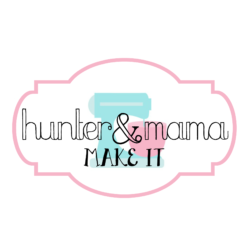 This busy, working mama is making time to share her love of cooking and baking with baby Hunter and with all of you! 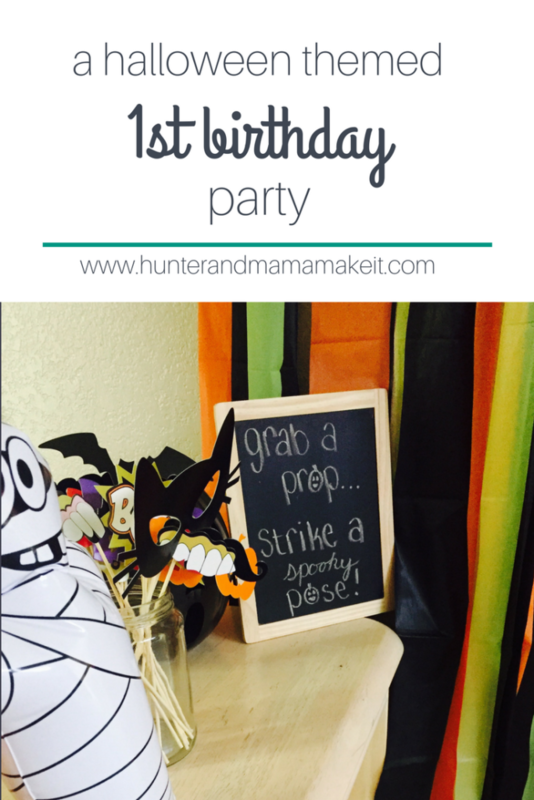 We have had a busy couple of weeks off… and boy are you in for some treats from all of our adventures!The BIGGEST event during our brief hiatus was Hunter’s first birthday! All the mamas out there have been telling me from the beginning how quickly it goes, but you never really understand until you’re living it! We have a ONE YEAR OLD! 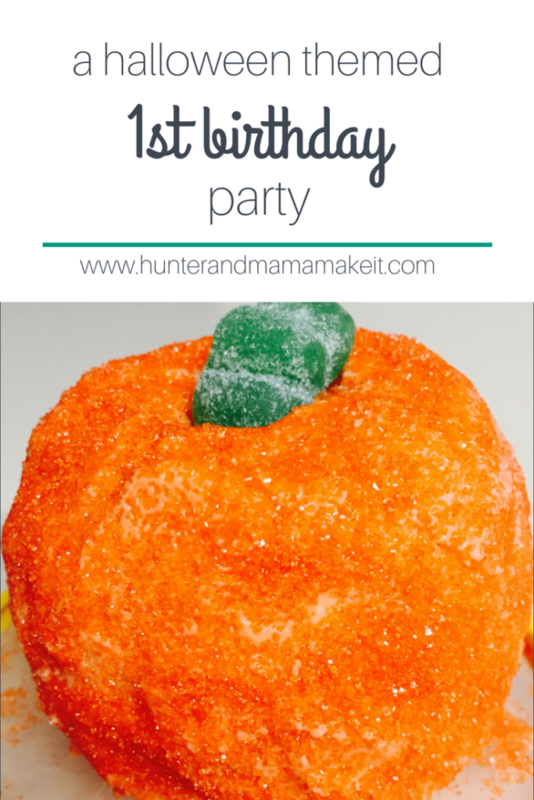 Because Hunter is a Halloween baby, we wanted to celebrate his birthday while incorporating a Halloween theme. 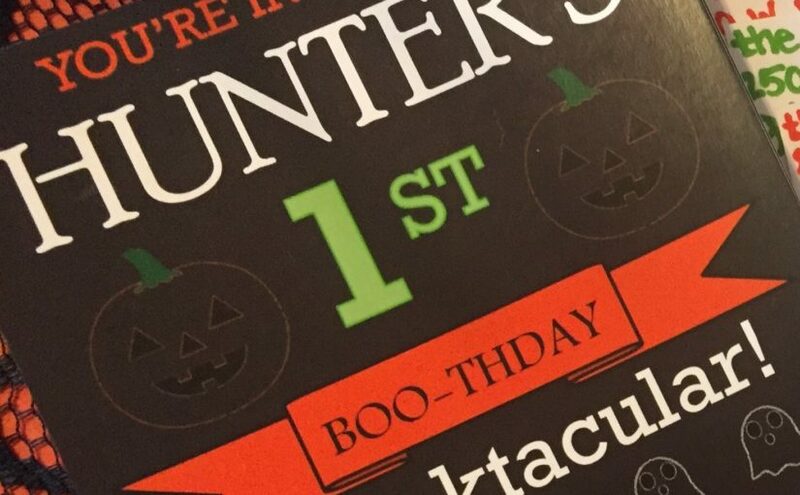 I’m sure as he grows up he won’t always want a Halloween birthday party, but for now it’s something special about him that is worth celebrating! Decorating for the party was fairly easy as we always decorate for Halloween anyway, but we had to add in some party balloons for Hunter’s big day! 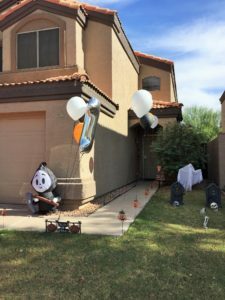 I grouped together a few latex balloons with his large 1 balloon to catch our guests’ attention, and then used more latex balloons to line the sidewalk up to the house. on the single white balloons, I used a sharpie to draw ghost faces. On the single orange balloons, I used a sharpie to draw happy jack-o-lantern faces. On the single black balloons I used a gold paint sharpie to write ‘eek!’ and ‘boo!’ It’s hard to tell from the photos because the wind was blowing… but it made a really cute effect walking up! Since it was a costume party, I wanted to make sure we had a fun place for kids (and kids at heart!) to take pictures all dressed up. I used three dollar store plastic tablecloths to make the photo backdrop. We pinned all three colors together to the wall and then used scissors to cut them into strips from the bottom. We left a few inches solid at the top to make sure the pins would stay secure. Then we knotted each section of the strips together to create texture and variance. 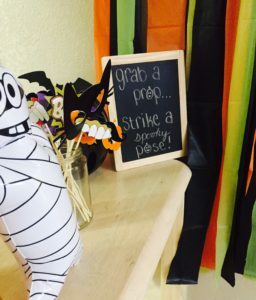 I finished the photo area with some mason jars full of Halloween themed photo props and a fun sign! 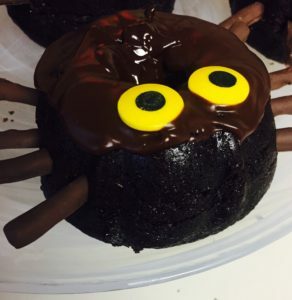 For these super cute creepy-crawlies, I used my favorite chocolate cake recipe and made mini bundt cakes. 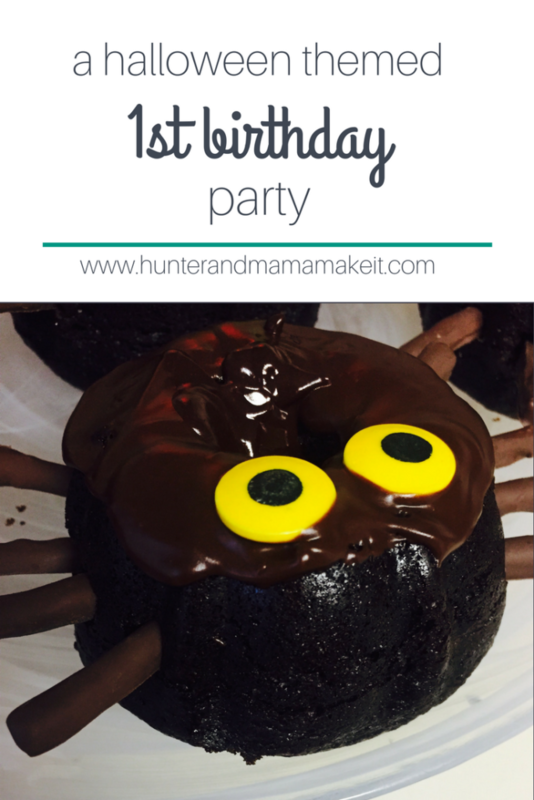 I then topped with a simple chocolate ganache frosting and used candy eyes and chocolate covered pretzels to finish the spider look! 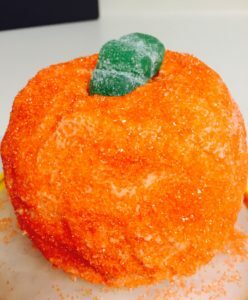 For Hunter’s smash cake, I took two of the vanilla mini bundt cakes I made and put them flat sides together before frosting with my homemade vanilla buttercream and using a TON of orange sugar sprinkles. 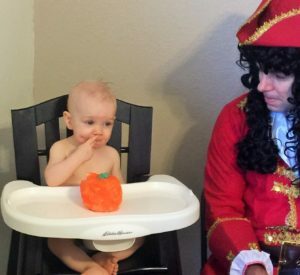 Because we were having a Halloween party, we felt that costumes would be a fun way to get everyone to join in the fun of the day. Of course, our family costume was of utmost importance! 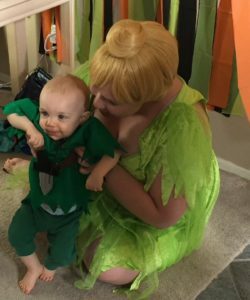 My mother-in-law made Hunter’s Peter Pan costume, and Cale and I assembled our Captain Hook and Tinkerbell costumes over the course of a month from costume stores and online shopping! The first taste of cake! 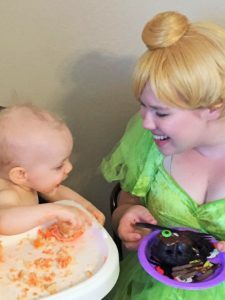 we had to take the costume off before the smash cake because we still needed a clean costume for Halloween day, too! Hunter and Mama enjoying the results of our hard work! It was so much fun Jill. You did a fantastic job!!! !